This Shelby has been sitting for decades and we've added new tires and exhaust. 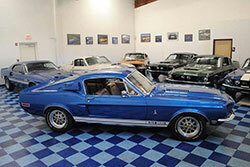 Original Shelby tags, interior and those hubs caps that are now desirable to restorers! 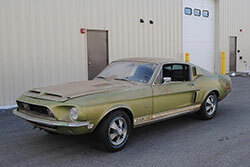 This is a tired 68 GT 350 that could be driven in its present condition and restored later. It does have some rust but has excellent patina. There's a couple aftermarket parts added but overall this car is very original. 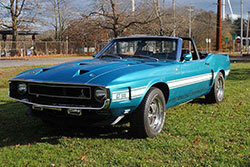 This very rare Shelby convertible is one of 90 left over 1969's that Shelby Automotive turned into 1970's. 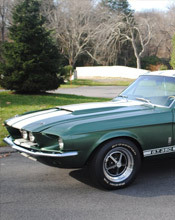 The 69-70 Shelby's were some of the most complicated and unique automobiles manufactured. The fiberglass nose and the roll bar made the convertible very noticeable and they quickly became a collectors item. The Gulfstream Aqua paint is fresh and the 428 Cobra Jet runs as excellent. This GT 500 is one of the lowest mile Shelby's in existence today. This rare vehicle has spent it's entire life in Southern California and has traded hands among car enthusiasts. The odometer shows an incredible 8676 original miles. It was originally purchased in Costa Mesa California in March 1969 by a Anaheim resident. To keep pace with the high performance times a Paxton Supercharger was added to the 428 Cobra Jet engine. Along with the rarity of Shelby's and the unique Paxton the vehicle was hardly used and kept in car collections and rarely shown. In 1989 Hot Rod Magazine did a cover on this GT 500 and mentioned it's 8000 miles at the time. Since then only 600 miles have been added. It was placed in storage for 23 years after the owner died and today it's one of the lowest mile GT 500's available. 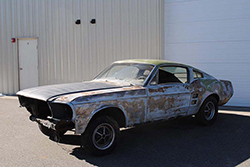 This vehicle is well documented in the Shelby American Automobile Club and we welcome an inspection to verify the condition and patina of this special Shelby.